Children introduced to the organ engage quickly with the instrument but what happens if one of them actually wants to learn to play it? Tom Daggett, St Paul’s Cathedral’s OBE Organ Outreach Fellow, has been taking digital organs into schools for assemblies and workshops for a number of years. Children from all backgrounds see, hear and play the instrument for the very first time. Inspired by models in York and Leeds, Tom and fellow organist Tom Bell, in partnership with Simon Williams from the Royal College of Organists, began to think about the next step – organ lessons for individual children. Today #Inspiring Organists continues to develop and currently six students in Hackney and Islington have recently taken up the organ. Together with music teachers and senior leadership in schools the team identify pupils with musical potential who are already Grade 4+ keyboardists and have the drive and commitment to succeed. 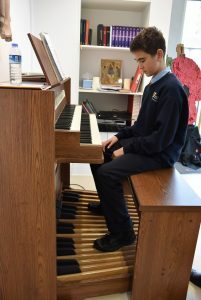 Thanks to #Inspiring Organists Matias Ademaj, a year 11 pupil at Urswick School in Hackney, is applying for sixth form music scholarships. He played the organ for his auditions and led worship at a service marking the Centenary of the Armistice. This term four new students have started tuition at St Mary Magdalene Academy. The programme has developed a close link with The Union Chapel, Islington who allow the use of their organ and sponsor some of the lessons. Practice facilities in schools are made possible through the support of Viscount Digital Organs. The company has installed five instruments in East and South London schools on a gratis long-term permanent loan. This is part of their commitment to inspire a lifelong love of organ music in these young people. Pupils are able to steal 15-20 minutes of practise during break and lunchtimes each day – and very importantly having the facility to become familiar with the pedals. Not only is #InspiringOrganists beginning to teach pupils who otherwise would likely never have the chance to learn, it is giving them access to excellent teaching. Lessons are offered by professional teachers in partnership with the Royal College of Organists – and the hope is that in time, more and more teachers across the country will want to enter into similar partnerships with local schools. One of the principal tutors is Jeremiah Stephenson (All Saints, Margaret Street), who teaches with real verve, imagination and flare. Tom Daggett says: ‘Equal access is essential to this work, and in order to reach any pupil in our partner schools who has the talent and potential to succeed on the organ, we need funds to sponsor their organ lessons on a means-tested basis. We have thus far received generous support from the Worshipful Company of Plaisterers as well as the Freemasons. The plan is to scale the project up, both in the schools already involved, and others further afield across London and, ultimately, the UK. #InspiringOrganists marks a step change in cultural attitudes in equipping the next generation by offering holistic solutions to learning.